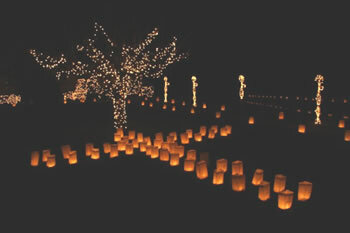 Illuminations of North Carolina is the largest supplier of luminarias in the United States. We've been selling luminary bags and bulk candles since 1989. We are very proud to offer luminary supplies MADE in U.S.A.
An outdoor candle display is easy and beautiful at Christmas or any time of year. Make your yard, neighborhood, and community glow! Our tea lights and votive candles are all made to our strict specifications, ensuring ease of lighting and wind resistant. Use our votive holders to make long burning candles. And our paper bag luminaries are the highest quality, making your luminary candles shine! We also offer clear and frosted luminary buckets as an option to the paper luminaries. 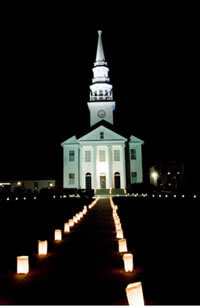 The easiest way to order is the Luminaria Kit - it includes everything you need. There are 3 kits to choose from - select the Luminaria Kit that best matches your needs. Whether you need a small quantity of tealight candles or bulk candles by the truck load - we can help you with high quality products MADE IN AMERICA at a very competitive price. Christmas luminary displays offer a great way to raise money for your non-profit organization. Many of the photos on our website are from Cheshire's Lights of Hope, a community organization that has grown from a small neighborhood project to a town-wide event that not only raises money for charities, it raises the entire community spirit!